You are Viewing Brand New Design Deer Hunter White Ring Bearer Pillow. 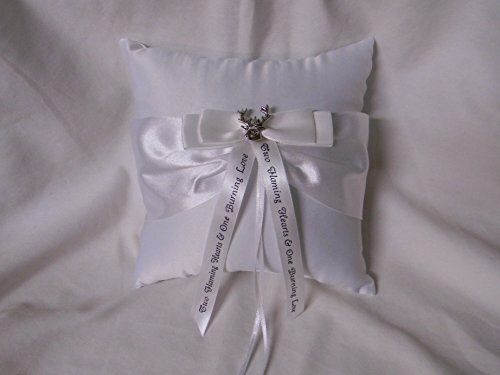 Pillow Covered in White Satin with White Satin Bow and Ribbons. Also Has (2) White ribbons to Tie the Wedding Rings. Designed with Silver Colored Buck Deer Charm with Message on Ribbon that Reads Two Flaming Hearts and One Burning Love. If you have any questions about this product by Custom Design Wedding Supplies by Suzanne, contact us by completing and submitting the form below. If you are looking for a specif part number, please include it with your message.